Brazilian power metal is what this quintet has to offer, and the eleven tracks that comprise "Terra Nova" are indeed mighty metal tunes. From the catchy hook of "Mother Land" to the sonic pulse of the title track, Eterna turn up the volume and pour out the glory, creating anthemic metal hymns in the Manowar vein. 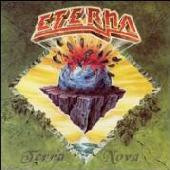 Keyboard overlays and strong vocals a la Fates Warning and TNT give Eterna a progressive edge, yet the overwhelming backbeats and robust guitar lines put the band over the top, making Eterna a metal band that any headbanger can truly dig. For more information, check out http://www.crashmusic.com.